A while back I had a real urge to go on spending spree as now I have a reason to always buy clothes – sixth form! I’m actually surpised how I managed to get all of this for just under £60 (not including the jeans)!! 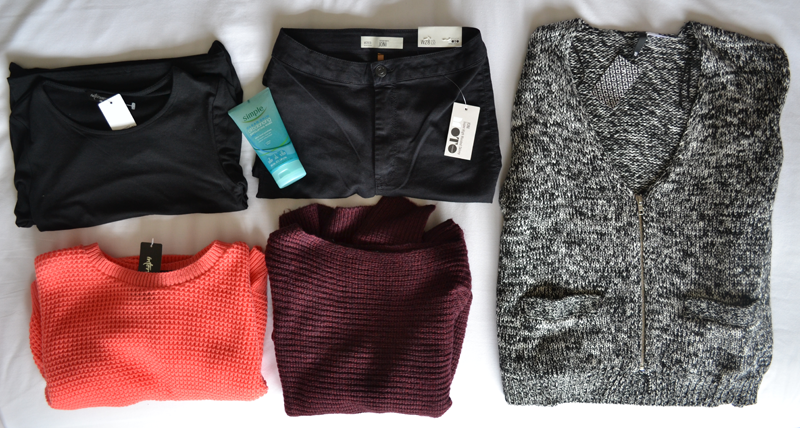 I particularly wanted some more knitwear because who doesn’t love cosy jumpers/cardigans?! I bought a black midi dress from Internacionale for only £15 – they’re super easy to wear and perfect for those ‘cba’ days! I also got a coral three quarter sleeve jumper for the same price – I picked it up instantly because it’s very similar to topshop’s and coral is my colour! I deffo needed some more colour in my wardrobe too. The burgandy jumper is from Primark for a mere £8 – I wanted some other colours but none were particularly nice and this colour is my all time fave to wear for autumn! I finally got mself a big knit cardigan from H&M for £20 – It’s zip up rather than buttoned but I loved the mixed knit of it. The jeans are the Joni Jeans from topshop – I’m deffo going to live in jeans this winter so decided it’s probably best to get another colour. Finally, the face wash was to replace my exfoliate scrub from body shop which has run out! What’s so wrong with blogging for money?